Escape & Explore … Relax & Retreat … See the best of Ireland with your own private driver, while staying in lavish 4* & 5* enchanting properties. Heritage Island Discount Card – Discount Pass & access to over 70 of Ireland’s Premier Attractions such as the House of Waterford, Titanic Dock Belfast, Bunratty Castle & much more! Cead Mile Failte – Welcome to Ireland! Arrive into Shannon Airport where a private driver will meet you to commence your private chauffeur tour of Ireland. Today you will travel south to Cork; enroute you can first stop in Tipperary. Here you can visit the Rock of Cashel – A spectacular group of Medieval buildings set on an outcrop of limestone in the Golden Vale including the 12th century round tower, High Cross and Romanesque Chapel, 13th century Gothic cathedral, 15th century Castle and the restored Hall of the Vicars Choral. Attractions include an audio-visual show and exhibitions. 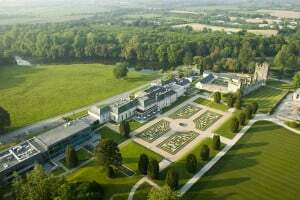 Arrive in East Cork and spend your first 2 nights in Ireland at the 5* Castlemartyr Resort – Set adjacent to the ruins of 800-year-old castle, this 220-acre estate has a 17th-century manor house where guests can enjoy far-reaching countryside views and a stylish spa center. Today you can explore Cork City & Blarney; or Midleton and Cobh. Cork City was named by Lonely Planet as one of Top 10 Cities in the World to visit in 2010. Steeped in history, Cork City is fast gaining a reputation as one of Europe’s hippest cities. Like Venice, the city is built upon water, and the city centre is built on an island in the River Lee, just upstream of Cork Harbour. The two channels of the River Lee which embrace the city centre are spanned by many bridges, and this gives the city a distinctive continental air. Exploring Cork is an enjoyable, multi-day pursuit. Ring the Shandon Bells in the 300 year-old tower of St. Anne’s Church, and marvel at the French Gothic spires of St. Finbarre’s Cathedral. You will discover unique shopping and dining options, including the famous English Market, with its stalls selling foods from all over the world. 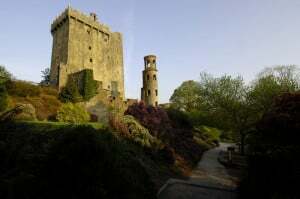 You may like to visit the famous Blarney Castle and the Blarney Stone, which has the traditional power of conferring eloquence on all who kiss it. The word ‘Blarney’ means pleasant talk, intended to deceive without offending. The battlements crowning the castle keep are typically Irish in form. Having climbed more than 100 steps, the famous Stone is set in the wall below the parapet, and to kiss it, one has to lean backwards from the parapet walk of the battlements. You can also visit the Blarney Woolen mills for some fine quality Irish produce. The American War of Independence put Cobh on the map. Napoleon kept it there and in the reign of Queen Victoria the town grew and prospered. It was as Queenstown that the port rose to prominence as a vital link in trans-Atlantic liner traffic in the late nineteenth and twentieth centuries. Its name was changed again in 1920 and as Cobh it continues to serve as an important port of call for the majestic liners traveling the north Atlantic route. Emigrants departed from Cobh’s quays on board vessels of the great shipping lines, such as Cunard and White Star. The “Titanic” sailed from Cobh, never to touch land again. The Heritage Centre will tell these stories in a way that is fitting and sympathetic of the endeavor and trauma of the people who were involved. The award winning Old Midleton Distillery & Jameson Heritage Centre is a lovingly restored 18th century distillery. A tour of The Old Midleton Distillery is a journey through the story of Irish whiskey via an audio-visual presentation, which is available in six languages. Follow the old distillery trail through mills, maltings, corn stores, stillhouse, warehouses and kilns and view the largest pot in the world prior to sampling the renowned Jameson Whiskey in the bar (minerals for children) . On offer too is an opportunity to become a qualified Irish whiskey taster, with presentation of certificate. .Afterwards, you can visit the gift or coffee shop. Return to Castlemartyr Resort for overnight. Travel via the spectacular southwest coastline today. Your first stop can be in Kinsale, south of Cork City. Every visitor to Kinsale is captivated by its beautiful setting, with the long waterfront, narrow winding streets and Compass Hill rising sharply behind the town. The old fortifications of Charles Fort and James Fort guard the narrow entrance to Kinsale from the sea. Not surprisingly the town is renowned for its fresh seafood and gourmet cooking, as well as the numerous ‘cozy’ pubs. Kinsale’s fame was established years ago as a quaint seaside town with a delicious restaurants and carefully preserved 18th century buildings. With the broad harbour and rich maritime past, Kinsale is a perfect town in which to stroll around during the stop on your tour. There are several small gift and souvenir shops in Kinsale where you can browse for that special momento of Ireland. 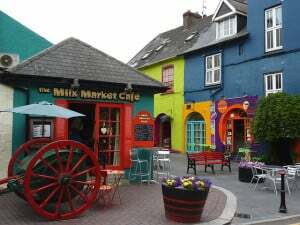 Or, quaint side streets, colourfully painted houses and the unique Irish pubs are yours to capture on film as you wander around this picturesque and historic setting. The town has poignant memories of the sinking of the liner ‘Lusitania’ in 1915, off the Old Head of Kinsale, and it was in the courthouse the inquest into the incident took place. Continue via Clonakilty, Skibbereen and onto Bantry Bay. You can visit Bantry House, home to the Shellswell-White family. Marvel at artifacts collected from worldwide travels and perhaps climb the 100 steps to the bell tower. Take a relaxing stroll through the gardens or just simply enjoy the view. 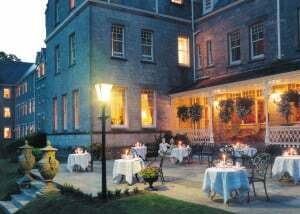 Continue onward to the heritage town of Kenmare where you will spend 2 nights at the Park Hotel. Overlooking the tranquil Kenmare Bay, this luxurious, 5-star hotel offers an opulent spa & sumptuous rooms with cozy bathrobes. 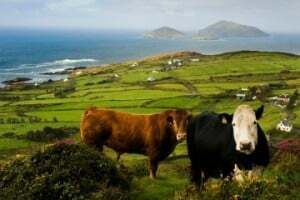 Alternatively spend the day on the Beara Peninsula – The Beara peninsula is a rugged rural gem, with many national archaeological monuments, with a coastline that stretches from Bantry Bay to Kenmare Bay. This is a peninsula of immense beauty and is very accessible from Gougane Barra via Ballylickey (19km) and Glengarriff and well worth at least one day exploring. Return to Kenmare for overnight. Bid farewell to the Kingdom of Kerry and drive via the lovely town of Tralee and onto Tarbert, taking the ferry to Killimer to then enjoy the wonderful scenery of the coast of Clare. 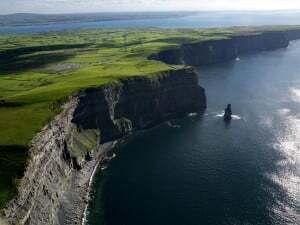 You will stop off at the Cliffs of Moher, which are great dark sandstone cliffs (600ft) that rise sheer from the Atlantic for nearly 5 miles. Screaming sea birds throng the ledges or wheel and swoop about the waves. The best views are from O’Brien’s Tower, built in 1853 by Cornelius O’Brien. Continue onto Doolin, a charming small seaside village on the northwest coast of County Clare. Set against the rugged Atlantic Ocean and surrounded by the spectacular bare limestone landscape of the Burren, Doolin is a place of breathtaking beauty. Traditionally a fishing village, Doolin is now renowned world-wide as the traditional music capital of Ireland. Home to thousands of international visitors each year, Doolin is many things to many people. For some it is a place to experience rousing music sessions nightly in the pub and for others it is a place of solitude and tranquility where one can refresh their spirits away from the everyday hustle and bustle of life. Explore the Burren which is a vast, bare, eerie limestone plateau that covers much of County Clare. It is gradually being established as a national park. The limestone is deeply fissured and most of the rivers have gone underground creating an extensive cave system. Four thousand years of farming has largely denuded the country of trees and vegetation but the Burren is noted for the “opposite” contrasts of its flower population with Mediterranean and Alpine species flourishing side by side. 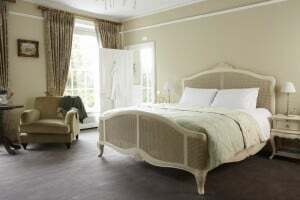 Overnight at Moy House – Built for Sir Augustine Fitzgerald, this enchanting, 18th-century Italianate-style lodge sits amid 15 private acres on an exhilarating, Wuthering Heights–like windswept cliff top that’s a three-minute drive from Lahinch. After a leisurely start to the day, head eastward to spend your last evening in Ireland. Travel via Ennis to Limerick City – Ennis, of a quaint narrow streets and broad visitor appeal, is a natural center to Clare’s unrivalled attractions. The town developed around the Franciscan Abbey, which was founded by the O’Brien Kings of Thomond in 1240, and is now a national monument. Over the centuries, Ennis became a thriving market town, which it continues to be today. It is a town that treasures its history and its culture and is proud to share this past with visitors. History abounds and its monuments and landmarks, such as the old Franciscan Friary, add to the great character of the town. Visitors particularly enjoy the range of shopping – including craft shopping and superb dining options to suit all tastes. Ennis is the traditional music capital of Ireland and music resounds from many centers, particularly from within its famous character pubs. 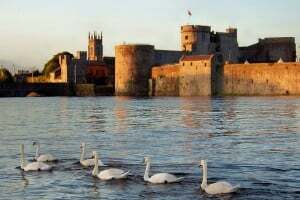 Crowned the 2014 City of Culture, the beating heart of the Shannon Region lies in Limerick City, with its pulse, the mighty River Shannon. Being the country’s third largest city it has a pace and dynamism you’ll find almost nowhere else in Ireland. Put simply, Limerick is a place for getting out and about. Heritage and hedonism co-exist comfortably in Ireland’s third largest city; where the medieval lanes surrounding King John’s Castle and the 800 year old St. Mary’s Cathedral, the elegant Georgian architecture of Pery Square and the treasure trove that is the Hunt Museum live side by side with the sociability of the city’s citizens, a buzzing nightlife, a thriving arts scene and a vibrant menu of year round festivals and events. Limerick is also rightly famed as the sporting capital of Ireland with the “spiritual home” of Munster Rugby, Thomond Park, dominating the skyline just outside of the city centre. Gaelic football, hurling, golf, horse-racing, walking and cycling are also particularly popular pursuits in Limerick. A flourishing restaurant scene that has been making headlines around Ireland and a wide range of top quality accommodation options makes this University City a must stop on any tourist itinerary to Ireland’s West Coast. Enjoy your last night in Ireland at No I Pery Square – This boutique town house is close to Limerick city center and across from Pery Square (Peoples’ Park). It offers free wired internet, luxury rooms and organic spa treatments. Suggested Flight Plan -Arrival and Departure from Shannon Airport. Interested in Irish Escape Luxury Chauffeur Tour?